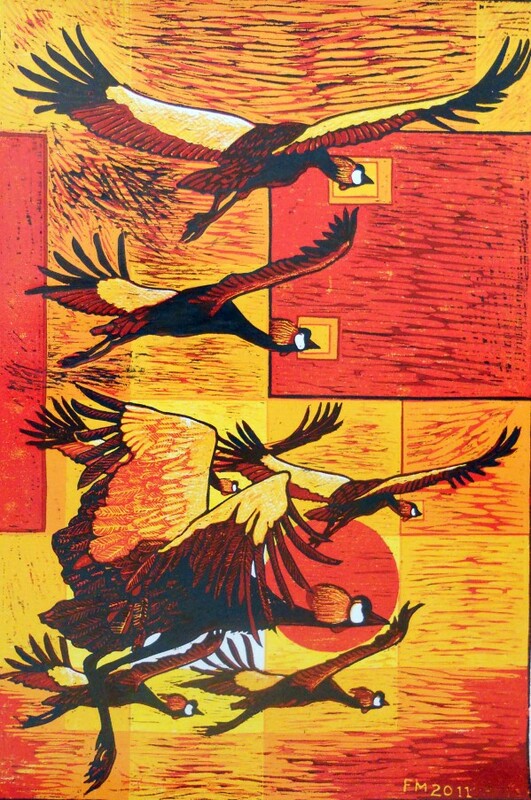 Fred Mutebi’s recent exhibition “Fred Mutebi: Woodcut collection since 2000” at Afriart Gallery was his first in Kampala in 10 years. 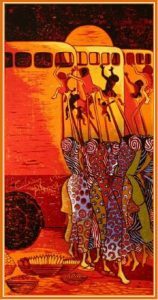 The artwork displayed was a testament to the skill and creativity that he continues to develop as a printmaker, artist, and social activist. Fred Mutebi's exhibition at Afriart Gallery, 2011. In the text from this exhibition, Fred presents the viewer with a challenge; to “Create your own story”. But what I think he is actually saying is place yourself in the story. Challenging the viewer understand that they are a part of each narrative, whether they are from Uganda or from elsewhere. I will highlight several pieces from this exhibition, in which the story is not only is not only about Uganda, but opens the opportunity for each viewer to find their own connection. In looking at the works from this exhibition, one cannot but help to feel what Fred feels for the struggles of his country and our world. Each work is not only a story, but a challenge to the viewers to have a role in the solution. How do you begin to understand all that is stacked against Africa and Uganda, without feeling helpless and insignificant in the shadow of something so monumental that you cannot see the beginning or the end, Fred creates. “Who is not playing their positions properly that Africa is scored against by all most every enemy for almost all the time? Poverty, hunger, wars, diseases, illiteracy, child mortality, maternal health, HIV/AIDS, environmental sustainability among others have scored against Africa all the time…” © Fred Mutebi. In the work “ENSOBI YAANI??? (WHOSE FAULT IS IT??? )”, Fred uses identifiable images to draw us into the action taking place. Players are thrown across the composition, entangled within the game, or battle. Their bodies converge; arms, legs, torsos combine to create chaos. It is in the details that you see the story continue; the ball with a map of the African continent is being “played” while the goalie is split in two, seeming to play for both teams. The lively colors and patterns of the uniforms, that initially draw your eye, begin to tell a story of the battle not only of the people, but of the environment through this visual reference to the wildlife of Uganda. In many of the works in the exhibition, references to and depictions of the animals of Uganda are used as metaphors and symbols. The current focus on our role in the environment is told through allusions to Uganda’s natural resources; it is not only about the struggle of the people, but how their decisions will filter to all that is around them. Fred also uses the attributes of animals, whether it be their strength, prowess, etc. as reference to the nature of individuals and the country as a whole. The instinctual nature of the marabou storks to hunt for garbage, the strength of the zebra when they travel in herds, the renewing nature of butterflies, all these characteristics are enacted within his narrative. “When these guys meet, it looks as though they are deliberating on real issues, it turns out what is their minds is how much and where they will pick their next meal to fill their crops. The endless meetings that are held by humans that never yield results.” (c) Fred Mutebi. If you have never encountered the marabou storks of Kampala, then count yourself lucky. These birds stand as tall as a small child; their gullets hang down a crude pink color, many times filled with whatever detritus they can manage to stuff down. In “TASK FORCE (KAKUYEGE)”, Fred manages to humanize these birds; they stand as though in conversation, yet they are looking all around, not toward one another. They overtake the composition, blurring anything that may be surrounding them; their gullets are gorged and visually forced to the foreground. 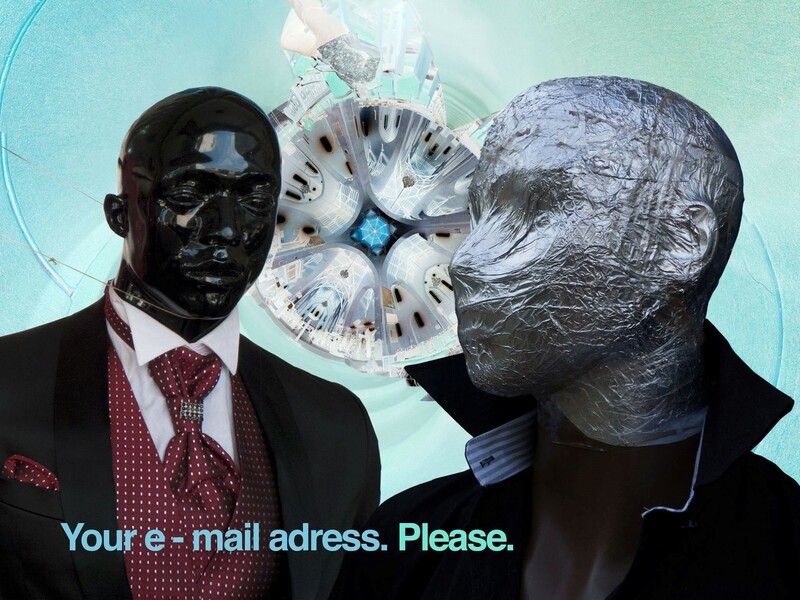 Their bodies and heads begin to melt together, becoming a large, black ominous mass. Wisely, Fred does not feed us with specifics of what they represent, be it political party, organization, country. This “task force” could be a part of my system as well as that of Uganda’s. Uninterested buyers, Interested buyers? Future at stake! Future at stake. (c) Fred Mutebi. Interested buyers. (c) Fred Mutebi. Uninterested buyers. (c) Fred Mutebi. Through each work in this exhibition, Fred confronts very hard, tough issues that face his community. With issues so heavy, how is it possible to tackle their depth through the medium of art? Fred is masterful at this; instead of hitting us with ugly images, harsh materials and muddy color, he lures us in with beauty. Then, when we are fully involved, the weight of what he is presenting begins to feel heavier and heavier. For the issues that are being addressed, this approach is respectful of their complexity, while alluding to what happens to them as they are glossed over, prettied up, and pushed back. The narrative of these works is quite straightforward. But what I appreciate about these are the subtle changes that occur from composition to composition. Fred is able to make the figures tell the story. His handling of forms and their interactions, throughout many works, alludes to the difficulties surrounding these issues, and the indistinguishing nature of them. The women in the composition begin as individuals; each pattern of her garment marks her, as one woman’s hand gently reaches behind to support her child. As the series progresses, these patterns begin to combine, the supportive had is replaced by the hands of the children, seeming to try to hang on. In the final piece, anything that once set each woman a part from the next is gone, replaced by a melding of bodies and a confusion of pattern; while the children are being thrust into an uncertain future. 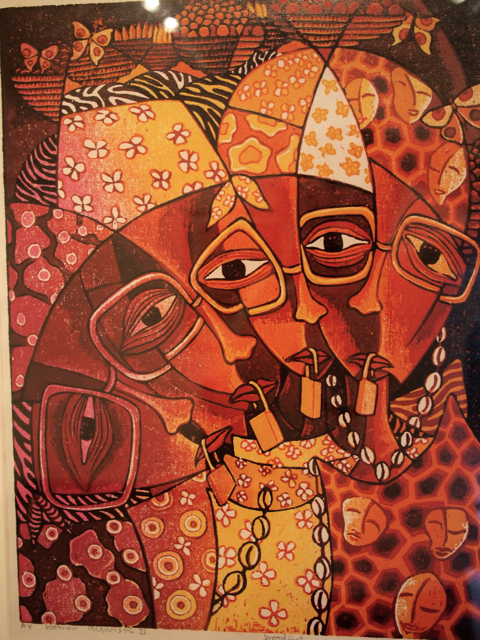 In his work, Fred addresses the many roles of women in Ugandan society. From the anonymous goods sellers in the previous work, to the series “Women Activists Then and Now”, the importance of women to society alongside their many struggles are shown through his narratives. Women activists; Then and now. (c) Fred Mutebi. 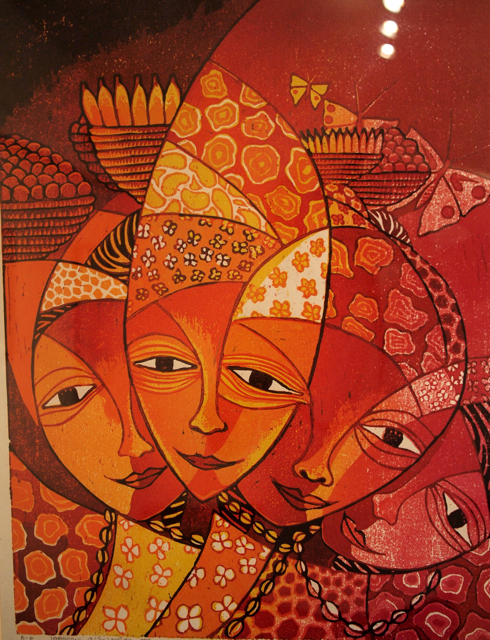 As in the previous work the women begin as individuals, their faces seem to show contentment while their close position suggests unity. In the second of the series they are visibly aged, the individual nature is being lost and the change in the intensity of color references the passing of time. The locked lips, broken beads and mask like references symbolize the current role of these activists. What I appreciate about the work is bringing this topic to light, but I feel it is still too anonymous as to their roles and individual nature. As I have seen in his newer works, the handling of the figures, especially the animals, is becoming less homogenous; individual characteristics are sacrificed for a certain style of abstraction. The strength of the works “The Rest in Flight” and “Eight in Flight” is evident not only in the content expressed through the symbolism, but the handling of the imagery. The birds are not stylized in a manner that distracts from their original nature, but it is emphasized through the mark making and grace of their forms. This is what I would like to see continue into Fred’s depictions of human forms and faces; not drawing so much on a style of depiction, but looking at the individual from where the inspiration comes and drawing from that character. Eight in flight. (c) Fred Mutebi. In line with Fred’s ideals, hopes and continued struggles, I should end this review with Eight in Flight and The Rest in Flight, these two works were shown alongside each other in the exhibition space. In Eight in Flight, the marabou storks appear again, as the “garbage cleaners” of Kampala, alluding to the presidential candidates of the last election. Their wings, beaks, bodies are all in a line, referencing an army whose intention is not evident. 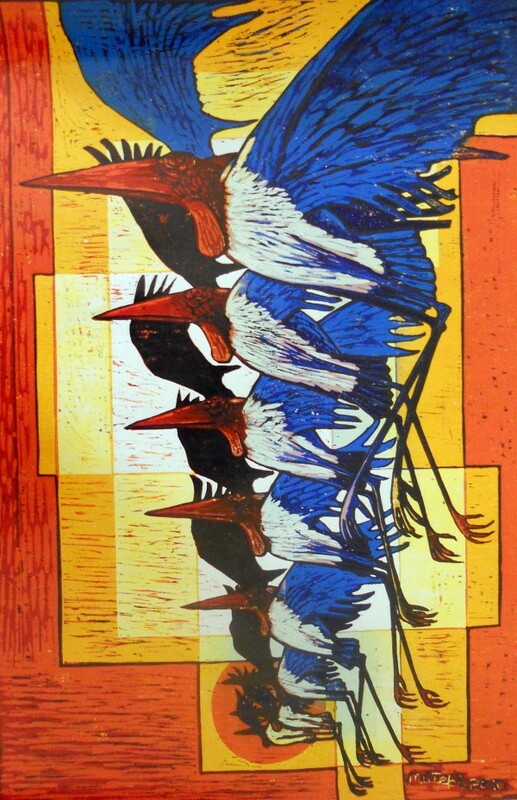 The hope comes through Rest in Flight, a work that highlights the beauty of Uganda through the national symbol of the crested crane. Unlike the chaos he is able to create in other works, this group is united in its goal; wings spread, heads down and all moving forward in the same direction. The setting sun in the background emphasizes the continuation of this journey towards “a peaceful future.” Fred ends with hope, giving the viewers a moment of relief to take a breath from the complexities and hardships facing Uganda. “Food for thought…” is the title I wish for this exhibition. This is what Fred’s work is all about, getting the viewer to stop, think, and hopefully act; and Fred does act. His artwork goes beyond the creation of these exceptional works. His art becomes actions through his community works, project development and dedicated promotion of the people and treasures of Uganda. Through his organization, Let Art Talk, Fred has been able to take these important conversations out of the gallery and to the people. 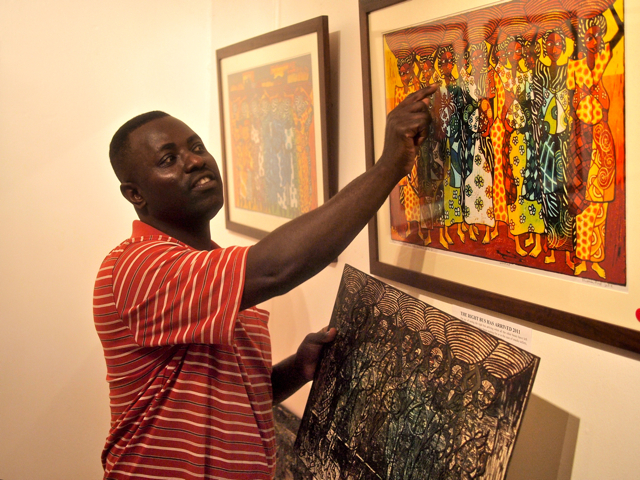 Ten years has been too long between exhibitions of Fred’s work in Kampala. His work needs to be seen within the context of his narrative to be most effective and bring about the most change. These are important conversations to have, they generate ideas, and hopefully action. I hope that Kampala, and the rest of us, will continue to see more exhibitions of Fred’s work in the near future. I will be looking forward to it. Lesli Robertson is a Lecturer at the University of North Texas and has collaborated with Fred Mutebi on projects that bridge the US and Uganda. *All text in quotations is from Fred Mutebi’s text labels from this exhibition. Please also read an interview with Fred Mutebi featured in this same edition of Startjournal.org. 100% right.lesli,i never knew you are also a good art critic.please write more. 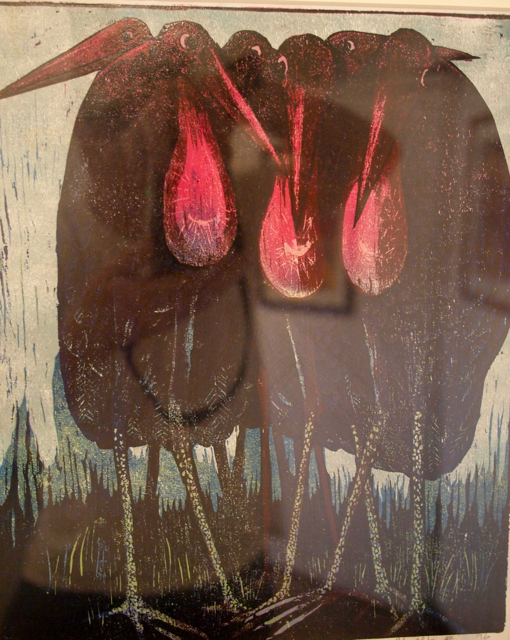 It is great to see your new work in this exibition! The beautiful bright colours of Eight in flight and The rest in flight. I agree with Lesli about the story of hope and renewing. This is a very strong couple to show the present situation of Uganda. The turning-point : following (under constraint) the usual directions or showing the daring new direction as free individuals in expressing own thoughts, feelings and motivation to get a freedom in which people expressing themselves and give inspiration to others. Looking for a new day with new chances. It is wonderful to have a friend as Fred Mutebi, member of a large worldwide family and to support him in telling his opinions and inspiring other people!